Texture Effects is a recent software release from Topaz Labs. It’s designed to help you add textured effects to your photography but you can achieve much more when you know how. “From Photography to Art” will help you master the many varied adjustments possible. The most successful photography works because it conveys feelings. Something connects with us at an emotional level and the photograph takes on a powerful meaning. Sometimes you can capture the feeling with the camera but you can also infuse emotion in post processing: Add a colour overlay adjustment to create a nostalgic atmosphere. Create a dark and foreboding atmosphere with textures and blending. Apply textures and borders to give your photography a fine art feel. Create retro colours and fading for a vintage feel. When you know how to use Topaz Texture Effects, all these things can be achieved with relative ease. •Learn to simulate retro effects by carefully combining the different adjustments. •Simulate photographic effects such as the Orton Effect and Holga type photography. •Create new and unique textures and borders using nothing more than the images that come with the Texture Effects software. In addition to giving you and explaining the software features with examples, the book includes two full length worked examples. The image files for these can be downloaded from the Lenscraft website, allowing you to follow along on your own computer. The only things you will need to transform your photography into art (besides imagination) is a computer and the Texture Effects software. A 30-day demo of the software can be downloaded from the Topaz website and this book includes access to a 15% discount if you decide to make a purchase. This is a short book at around 22,000 words, which will save you time both in learning the software and achieving impressive results. It’s not padded out with filler material but has been designed to deliver the salient facts as effectively as possible. It assumes no prior knowledge and will have you using the software like a professional in a matter of hours. 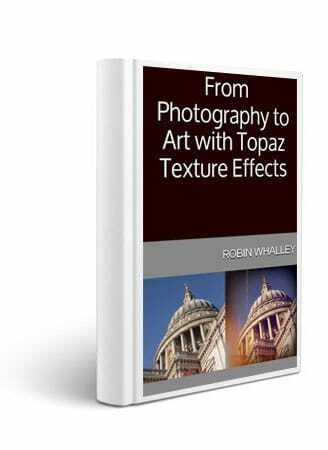 Even if you already use this software and have watched the Topaz Tutorials, most users will find something new and original in this book.